A disease, that our Immune System tries to fight against. The immune system protects our bodies from disease. 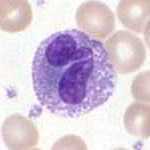 Cells called white blood cells found in our blood are able to kill bad things such as Bacteria and viruses. There are many different types of white blood cells. Some of them make things called antibodies that stick to things that enter our bodies making them easy to find. Other white blood cells get rid of bacteria and stop viruses like the flu. When our immune system does not work well, we are vulnerable to disease caused by Bacteria and viruses. Problems with the immune system include allergies where white blood cells attack things are not bad like pollen in our eyes or cat dander. AIDS (Acquired Immunodeficiency Syndrome) a disease caused by a virus that kills some white blood cells leaving our bodies vulnerable to bacteria or viruses. This page was last edited on 15 September 2009, at 00:43.